Applicable for lift-conveying of solid, granular, small-sized products, and more often for secondary lifting solution due to field space limitation. 1. Able to perform in continuous or intermittent conveyance and support other feeding equipment. 2. Bowl made of food grade PP material and able to quickly remove from machine for cleaning. 3. 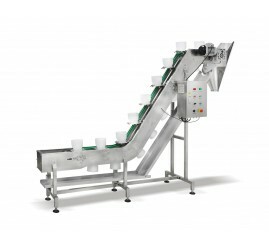 Able to achieve second feeding (need to adjust the timing) and the conveying speed is adjustable. 4. Even when the bowl is in inclined position, it can still be kept level and the product will not overflow. 5. Able to connect with rotary packaging machine to achieve solid & liquid mixed product packaging.